Today sees the publication of a paper in the journal The Lancet Oncology written by PHE and Cancer Research UK on 30-day mortality following chemotherapy on patients with breast and non-small cell lung cancer treated in England in 2014. The paper is accompanied by a PHE report which includes trust-level data. Chemotherapy given to treat cancer patients is powerful medication – used to kill cancer cells – and it’s impossible to avoid causing some damage to other cells and tissues in the body. So when we give the medication to kill the cancer cells patients get sick - sometimes very sick - and some may die. Getting the balance right on which patients to treat aggressively and which not to treat, can sometimes be hard. There are lots of factors a doctor has to take into account. How advanced is the cancer? What is the potential gain from treatment? Does the patient have other illnesses? How generally fit and well are they? Are their heart, lungs, liver, kidneys working well? Are they overweight? A smoker? These are all factors that we know can affect how well someone might be able to tolerate the serious side effects that come with these strong medicines. Our National Cancer Registration and Analysis Service now has good enough data on all cancer patients treated with chemotherapy that we can begin to look at how good we are at getting these difficult decisions right for all the patients we treat. This is not a clinical trial that has to select a certain group of patients that are generally younger and healthier than the overall group of patients seen by the NHS, it's about all patients treated in England using routine data supplied directly by the hospitals looking after them. For this report we looked at all women treated with chemotherapy for breast cancer and at all the patients with lung cancer in England in 2014. As well as overall 30-day mortality we also look at the factors linked with 30-day mortality for the breast cancer patients and patients with the most common form of lung cancer –non-small cell lung cancer (which accounts for nearly 9 out of 10 lung cancers). It’s important to note that not all patients with these cancers will get chemotherapy, some will have radiotherapy or surgery or both. Our study only includes the patients who received SACT (Systemic Anti-Cancer Therapy) treatment in 2014. 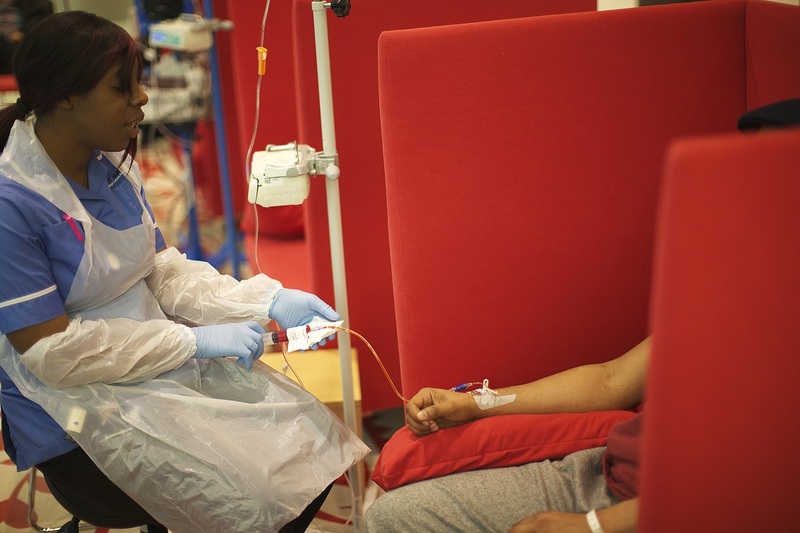 We then split the patients who had chemotherapy into two main groups. There are those who are given the medication with the intention to increase the chance of curing them (so called curative intent) and the others where their disease has advanced so far that they cannot be cured, but where the chemotherapy will reduce their symptoms and improve their remaining quality of life (so called palliative intent). There were a few cases that we had to leave out where we had not been told the treatment intention. This left us with 23,228 patients with breast cancer and 9,634 patients with non-small cell lung cancer to study. In each of these two groups we then asked how many patients died within one month (30 days) of the start of their most recent drug therapy. When we look at the figures we see that most of the people who died within one month were in the palliative treatment group – 7.5% (569/7,602) of women with breast cancer and 10% (720/7,673) of people with non-small cell lung cancer. These are patients who could not be cured of their disease and between 8-9% of this group died within a month of starting therapy. There were also deaths in those patients given treatment with the intention to try and achieve cure. These were much fewer; 0.3% (41/15,626) of breast cancer patients and 2.7% (53/1,961) of non-small cell lung cancer patients. It is the next steps in the investigation of these patients that makes this study so powerful and important. No doctor sets out intentionally to harm their patient and we all know that chemotherapy has risks. Patients need to be selected and assessed carefully before they start treatment to make sure they can withstand the side effects that will get from these drugs. In some cases it is a difficult judgement – one that clinical teams must make every day. It would be all too easy to have excellent early survival figures by choosing not to treat any patients; but then the majority who might get the longer-term benefit will miss out. As so often it is a fine judgement of benefits and risks for each patient. It is important to emphasise that while there are clearly risks that come with chemotherapy, the number of deaths in the first 30 days is very small and there is no evidence that they are excessively clustered in one or two providers. Most patients given the medication become unwell, but the majority of Trusts had no deaths at all- but deaths do occur occasionally. In our data among 15,626 breast cancer patients receiving curative treatment there were 41 deaths within 30 days and among the 1,961 non-small cell lung cancer patients receiving curative treatment there were 52 deaths during the year. These were scattered across 53 different Trusts – just under half of the total number of Trusts. PHE’s National Cancer Registration Service has been collecting the SACT data on all patients given chemotherapy in England and it has been complete since mid 2014. We are now confident that the data quality from that period onwards is good enough to support analysis on nearly every Trust in England. The SACT data includes details of the medication given, and also how fit the patient is (the so called performance status), their body mass index, their age and a variety of other pieces of information that cancer clinicians feel are the most important to collect. We then link the SACT data to other relevant clinical data held by the National Cancer Registry. For example, in this study we used the Registry data to look at how advanced or early the breast cancer patient’s cancer was when they were diagnosed. Using this linked, rich data on every patient treated, we have been able to adjust the number of deaths related to chemotherapy for each hospital, allowing for all the other information we know about the patient. We can then calculate this ‘risk-adjusted’ death rate to see whether there are more or fewer deaths than would be expected based on the overall picture. We found that there were six centres treating breast cancer and five treating lung cancer with an intention to cure where the risk-adjusted scores were outside the limits we might expect. Overall there were few deaths – but the numbers for these organisations were higher than we would expect them to be. We shared our findings with these hospitals and asked them to review their practice and data – and we have published their comments along with our report. There are other important findings from this work that will help us to treat patients with chemotherapy better. There is always a risk that this toxic medication will harm or even kill a patient and we are able to use our data to help identify which patients might be at most risk. Perhaps not surprisingly we found that for curative treatment the older patients with more advanced disease, who also had a worse performance status, were more likely to die. Patients with a high body mass index (BMI) did slightly better – possibly because overweight patients are often given lower relative doses of chemotherapy, while patients with a low BMI did less well – possibly because their cancer had already caused weight loss and so they were less able to withstand the stresses of treatment. Most importantly, we also found that patients were most likely to die when being given their first round of chemotherapy – so we have advised oncologists to be most aware of the risks in this group of patients. Finally, this work gives us new insights about the real-world treatment of patients in the NHS in England compared to the results from clinical trials. Clinical trials are important first tests of a new treatment – but they are conducted on relatively small numbers of patients and by necessity they tend to include patients that are less sick and younger. For breast cancer treated curatively, our data matched that from trials when we compared patients of similar ages, but the older patients in our group (who were not included in the trials) did less well. Early death rates from trials in the treatment of non-small cell lung cancer with curative intent are around 0.8%; we found a death rate of nearer 3% across the NHS. These findings based on detailed information from thousands of patients across England will help us make better judgements of the balance of benefits and risks associated with high cost, potentially toxic medication. This is an impressive first, detailed and critical use of the SACT data in Public Health England’s National Cancer Registration and Analysis Service. We accept that there is still more to do to improve data quality and consistency – but the resource we have will allow us to monitor the quality of chemotherapy treatment given to all patients across the NHS in near real-time. This detailed study could not have been achieved without the support and help of all our colleagues across the NHS and Cancer Research UK. But, it is ultimately only possible because of data that is routinely collected by the NHS as part of all cancer patients’ care. We will continue to use these data carefully and present our findings openly in our efforts to improve patient care.